Another absolutely BRILLIANT, BRILLIANT DAY with the Ready To Rockers in a packed Havant Workies main hall yesterday. Yes, Ready To Rock School is having its annual Spring gathering at the excellent Leigh Park Workies... one, to make 'a hell of a lotta noize' to entertain the RTR troops and the mildly curious ...and two, to raise some funds for a wonderful and brand spanking new 'not for profit' venture that is providing events for those with special needs and disabilities, namely MAKING A DIFFERENCE INCLUSION DISCO. THE JARH....GOING FROM STRENGTH TO TO STRENGTH!! In the space of two years, Havant RTR students, Jake, Riley and Albert , have gone from jamming around at each others houses, to performing a handful of brief appearances at fetes and pub gardens, to now becoming, with the incredibly fortunate link up with friend, Holly, not only 'the youngest rock band on the South Hampshire circuit' but also one of the busiest bands out there too. A remarkable set of youngsters, with appearances at The Wedgewood Rooms, Victorious Festival, Portsmouth Guildhall and GosFest , The JARH are becoming the band to see on the local pub music scene, due to the maturity and quality of their performance and the variety of songs that they play. A brilliant set of youngsters that continue to amaze their audiences and their much more mature contemporaries ..."They shouldn't be this good at their ages surely...but they are!" The latest young band from RTR School is NO PRISONERS! Current Portsmouth students, JOSH LLOYD, TOM McDONALD and KIERAN BOYD have linked up with Havant student, Vicky Steel and former Waterlooville vocal student, KIRSTEN PETHER to form the hi-energy outfit, NO PRISONERS with gigs already under their belt including their very first appearance at the legendary Wedgewood Rooms! WHAT A GREAT GIG...AND THANK YOU FOR YOUR HELP!! What another extraordinary Sunday afternoon down at Mr Priestly's legendary Wedgewood Rooms!! Roughly five and a half hours of TOTAL ROCK with so many highlights throughout...quite the achievement!! Well done all!! John, understandably couldn't make it but wife, Gina was there, as were a good number of their family, including daughter, Layla. 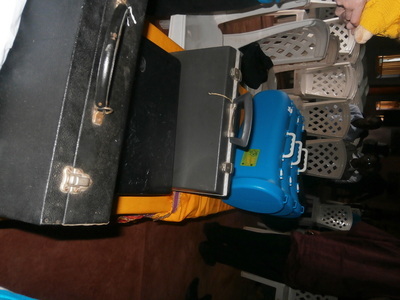 Monies raised :- £75.84 cash containers and £1443 ticket and door receipts , therefore £1518.84. 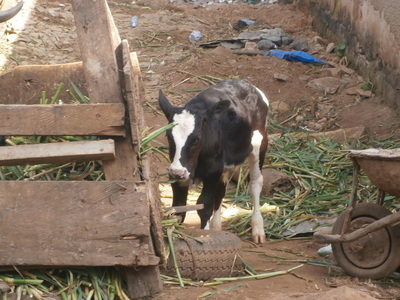 100% of the latter was donated to John and the sealed containers to MNDA (S.E. Hants & Portsmouth). Gina, John and Layla have expressed their heartfelt gratitude to us all and a thank you letter was received from MNDA. JOHN REALLY NEEDS YOUR HELP!!! UPDATE:- in light of John's current situation, 100% of the ticket proceeds will now go towards his ventilator costs. I've informed MNDA head office that we will happily accept any voluntary cash donations for the charity during the afternoon. MUSOS & MUSIC FANS....THIS IS A CALL TO ARMS...JOHN WALTON NEEDS YOUR SUPPORT!!! £5 ....12 BANDS ..TO SUPPORT ONE OF OUR OWN IN HIS TIME OF NEED.... 100% of the ticket proceeds will go towards John's need for a ventilator, with a cash collection going to the local Motor Neurone Disease Association branch. WE'RE BACK AT THE WEDGEWOOD ROOMS RAISING MONEY FOR JOHN & MDNA. 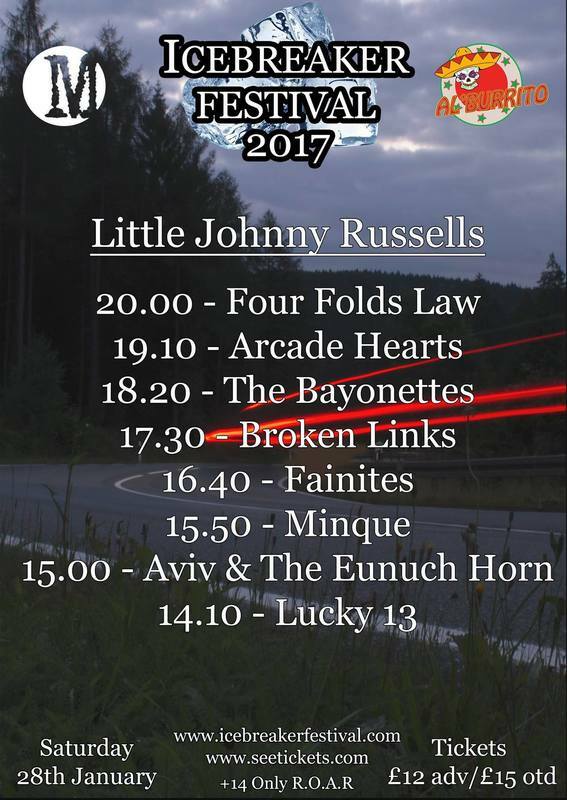 Come and join the Ready To Rock School bands and their 200+ fans for another fantastic rock marathon raising funds for John!! 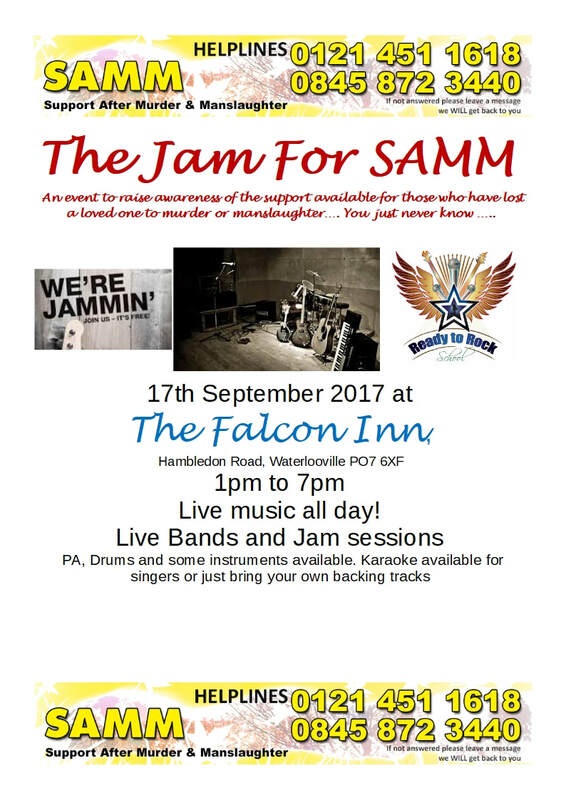 £5 ....12 BANDS ..TO SUPPORT ONE OF OUR OWN IN HIS TIME OF NEED. 100% OF TICKET PROCEEDS TO JOHN & MNDA. THE COLLISION - TUTORS CHRIS AND EVAN ARE OUT ON TOUR!!!! VICTORIOUS '18 - .... AND THEN THE HEAVENS OPENED BUT WE KEPT ON PLAYING!!!! 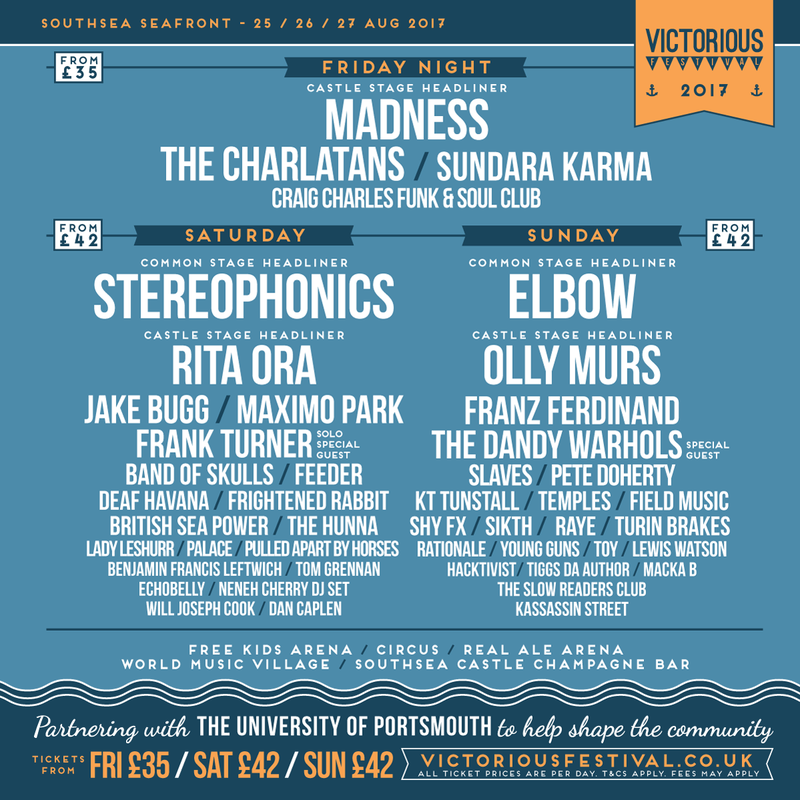 ​WE'RE BACK AT VICTORIOUS FESTIVAL!!!!!! ​THE READY TO ROCK SCHOOL COLLECTIVE IS BACK AT V.F.!!! READY TO ROCK SCHOOL COLLECTIVE ARE 'ALL OVER' THIS WEEKEND!!! This weekend is another amazing music packed weekend featuring loads of RTR School Collective members, as asterixed. 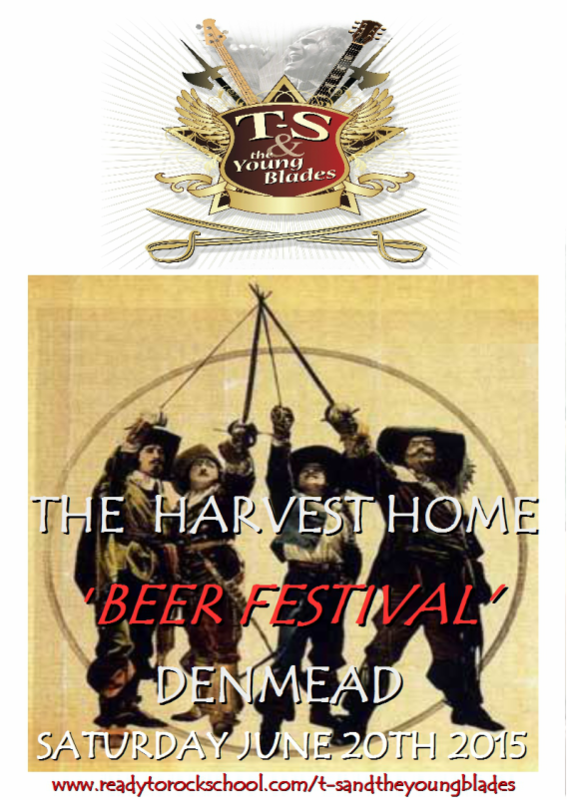 The Red Lion in Chalton BeerFest and Gosport Waterfront Community Festival ...both start today...7pm & 6pm respectively. THE RED LION CHALTON'S BEERFEST 2018!!! SUNDAY 29TH JULY - the 'chill out' day! READY TO ROCK SCHOOL'S SUMMER CHARITY GIG 2018!!! A DAZZLING NEW THEATRE AND A BRILLIANT NEW ROCK SHOW THAT WILL HAVE YOU SINGING TO THE ROOFTOPS AND DANCING IN THE AISLES ........WHAT A FANTASTIC COMBINATION!! ​"Superb!" "Fab night!" "Brilliant!!" "Absolutely amazing!" "Fantastic gig!!" READY TO ROCK SCHOOL AND PARK COMMUNITY THEATRE, ARE DELIGHTED TO BRING A BRAND NEW AND EXCITING LIVE ROCK SHOW TO THE SOUTH COAST'S NEWEST VENUE......LEATHER & LACE!!! "Leather & Lace" is a dynamic new show bringing all those 'Classic Rock Anthems' & 'Power Ballads' you know and love to the stage. Led by frontman and READY TO ROCK SCHOOL owner, MARK THOMPSON-SMITH, this superb 7-piece rock band, features some of the finest musicians & singers on the circuit today, faithfully recreating the 70s/80s/early 90s classics from artists such as, Journey, Bon Jovi, Heart, Queen, Whitesnake, Europe, Boston, Cher, Foreigner, Bryan Adams, Alice Cooper, Aerosmith, Mr Mister, Extreme, KISS, Toto, Def Leppard, Van Halen and many more. With band members havIng played in 'The Sweet', 'Praying Mantis' 'The Supersonic 70s',' Rock Anthems', 'Dressed To Kill (KISS tribute)', 'Dizzy Lizzy', 'Metalworks (with members of Judas Priest and Alice Cooper)', 'Marco Mendoza Band' and 'Son Of Man' to name but a few, you know that their pedigree is high and their standard of musicianship still higher." Here are three of our Havant students, Jake, Albert and Riley with their good friend, Holly, on vocals...they're called THE J.A.R.H....they take lessons...they jam ...they play our gigs...they play their own gigs... event organisers and pubs now call them to play their gigs too...they've played at The Wedgewood Rooms and they've played at Victorious Festival.......their average age is 13. 'NOT ALL MUSIC LESSONS ARE THE SAME!" READY TO ROCKERS STORM THE GOSPORT COMMUNITY WATERFRONT FESTIVAL!! 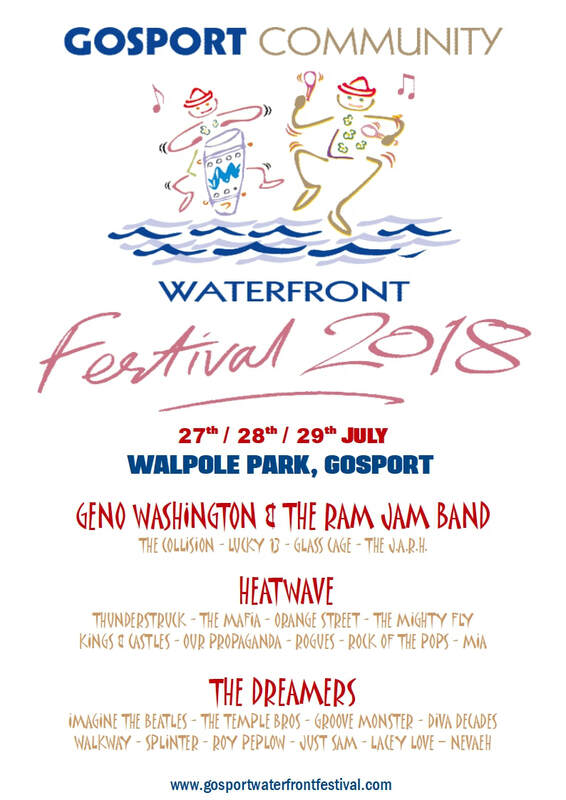 The organisers of the re-kindled GOSPORT COMMUNITY WATERFRONT FESTIVAL have asked the Ready To Rock Collective to open up the Friday night for headliner and soul legend, GENO WASHINGTON & THE RAM JAM BAND!! Brilliant!!!! Kicking things off, are the youngest rock band on the local circuit namely THE J.A.R.H. , average age of 13, with over 20 gigs booked in this year already proving the axiom that age is no barrier! Next up, RTR Team Leader, Matt Purkis fronts his r&b and grunge tinged band, GLASS CAGE, full of that extra special raw edge that is setting them apart from the pack. Indie rockers, LUCKY 13, led by the mesmerising vocal talent that is Ella May Payne, are the pride of the RTR School Collective with nearly 5 years of performances on the local circuit and beyond, with electrifying appearances at The Wedgewood Rooms, Portsmouth Guildhall, Victorious Festival and the 02 Islington. The final band is local indie/pop rock favourites, THE COLLISION, fronted by that force of nature, LEWIS SMITH with RTR tutors, Chris & Evan Latter. Hi energy and daftly catchy songs means one HUGE Collision party!! THE COLLISION...don't miss 'em!! ANOTHER FANTASTIC GIG AT WORKIES!! Yet another fantastic gig at Workies last Sunday afternoon!! Rockers and full hall to boot! :) The performances were once again, up another gear even from The Wedgewood Rooms gig in December and I thought that was the best gig we'd done so far in all of the time or running RTR....quite amazing. It doesn't seem like 5 minutes ago since newly formed L13's Ella Payne, Oliver Baker, Fraser Purser and George Seymour-Cole were starting out, average age of 13, with their half hour sets in the local pubs...and look at them now!! Wedgewood Rooms/Victorious/O2 Islington etc. with so much more ahead of them! ...and now we have THE J.A.R.H. 's Jacob Simmons, Albert Trevellick, Riley Hawley and Holly Barnett, average age of 13, following in their footsteps!!! SPRING CHARITY GIG ALREADY??? MUST BE WORKIES THEN!!! 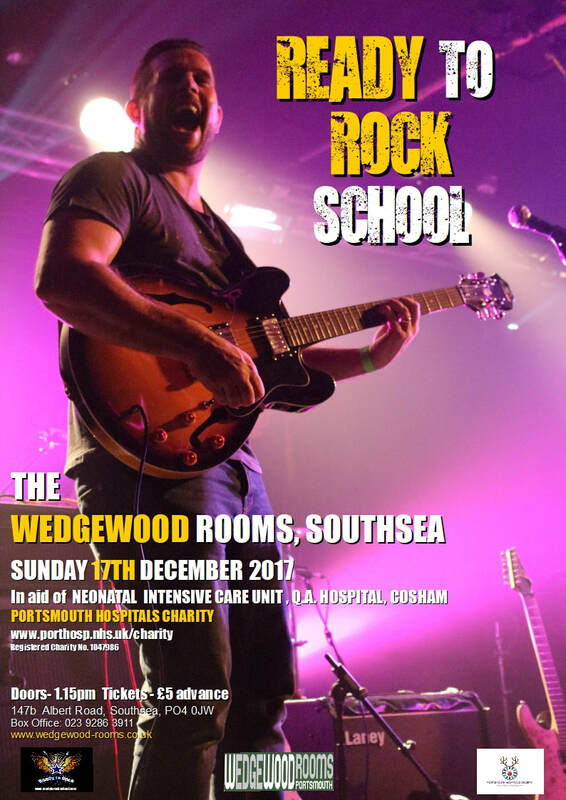 READY TO ROCK SCHOOL are back at it.......'bringing on the noize' and raising some much needed funds for another worthy but little known charity namely, the Petersfield based FitzRoy with our donation earmarked specifically for their wonderful LOVE4LIFE project, located in Fareham. Photo courtesy of Tim Hills of Tim Hills Photography. WHAT A VERY SPECIAL MORNING!! I was finally able to hand over the Ready To Rock School cheque, to two lovely members of Q.A. Hospital's Neonatal Intensive Care Unit team. The £1376 raised, from our Wedgewood Rooms gig, will help to go towards much needed new equipment within the department and many thanks and much appreciation was expressed to all who helped raise the funds for our donation. What a wonderful way to say "Thank you" to such an amazing department and team...they really do perform miracles for little miracles!! WE CAME, WE PLAYED....WE CONQUERED!!! What a day!!! What a triumph!!! Our third visit to the legendary Wedgewood Rooms in Southsea...and it just gets better and better each time! So many band and solo highlights across the full 6 hours and in front of a packed house too. Petersfield, Portsmouth, Havant & Waterlooville Ready To Rockers...WE SALUTE YOU!! Absolutely stunning!! Here's part of Pompey's tribute to Prince...oh my...wonderful!! WE'RE BACK AT THE WEDGEWOOD ROOMS!!!! HE MADE IT TO THE TOP!!!!! 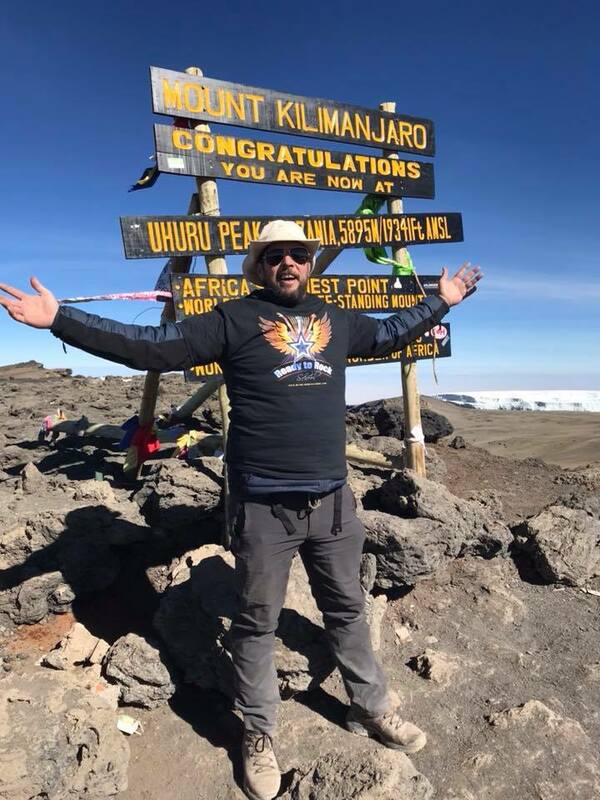 THE ROCK GOD'S HEADING UP KILIMANJARO FOR ROWAN'S HOSPICE!!! THE ROCK GOD'S TAKING ON THE ROCK!!! Some will know Lee McDonald and his son, Tom but the vast majority won't. 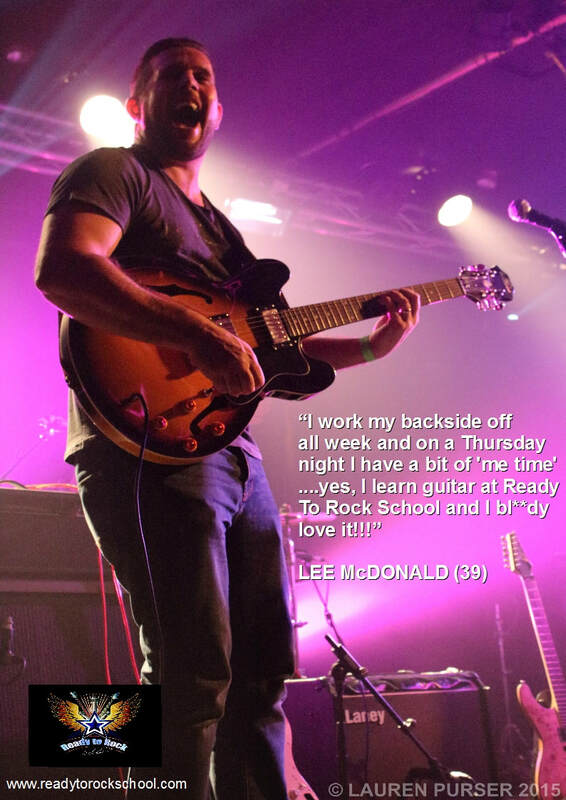 ​Both Lee and Tom are students of RTR School, Lee learning guitar at Waterlooville and Tom drums at Portsmouth. Both the 'boys'...Lee's just a bigger lad after all ...are great chaps and throw themselves wholeheartedly in to their lessons and gigs. After Lee's inaugural outing at The Wedgewood Rooms and the subsequent brilliant photo taken by Lauren, he's become one of the RTR poster boys and was termed by me as 'The Rock God'! Not only does he deserve a massive ROUND OF APPLAUSE...but I'm sure that you'd all like to show your support for his efforts in raising much needed funds for Rowans Hospice too. LUCKY 13 ARE PLAYING IN LONDON @THE O2 ISLINGTON!!!! 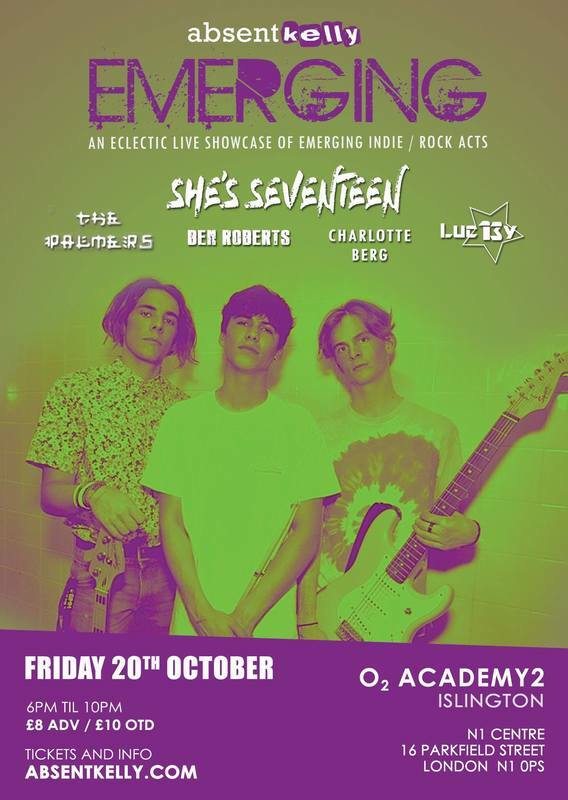 Ella, Fraser, George & Olly are playing at London's popular O2 ACADEMY - Islington on FRIDAY OCTOBER THE 20TH!!! The 'Absent Kelly Emerging' evening features up and coming bands from across the UK and beyond and our own LUCKY 13 get the opportunity to join American artist CHARLOTTE BERG, KEYS, THE PALMERS and headliners SHE'S SEVENTEEN. Doors open at 6pm with L13 opening the show! Tickets are £6 from the band or £9 from the venue! Add to that they are on Express FM. next Monday the 18th September, at 7pm on The Shout!! 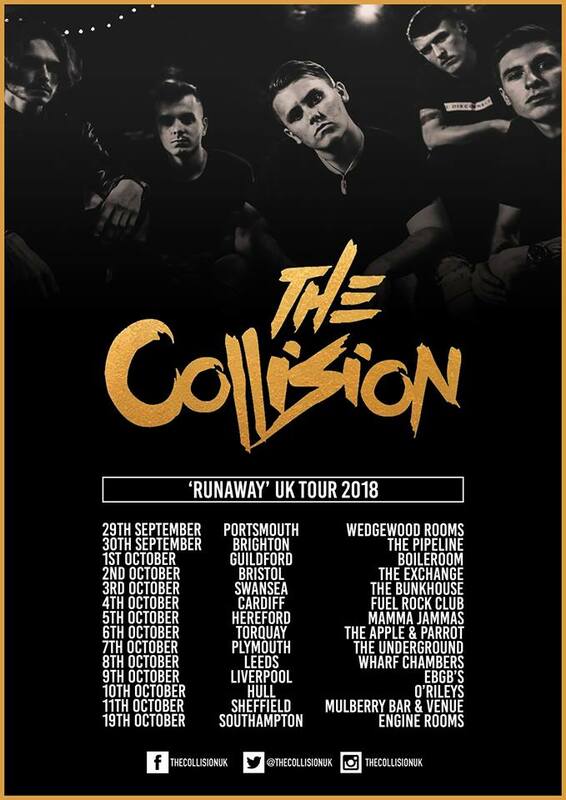 THE COLLISION ARE HEADLINING THE WEDGEWOOD ROOMS!!! TICKETS :- £6 ADVANCE DOORS 8PM - under 14s MUST be with an adult. ....THREE IS THE MAGIC NUMBER!!! THREE IS THE MAGIC NUMBER!!! 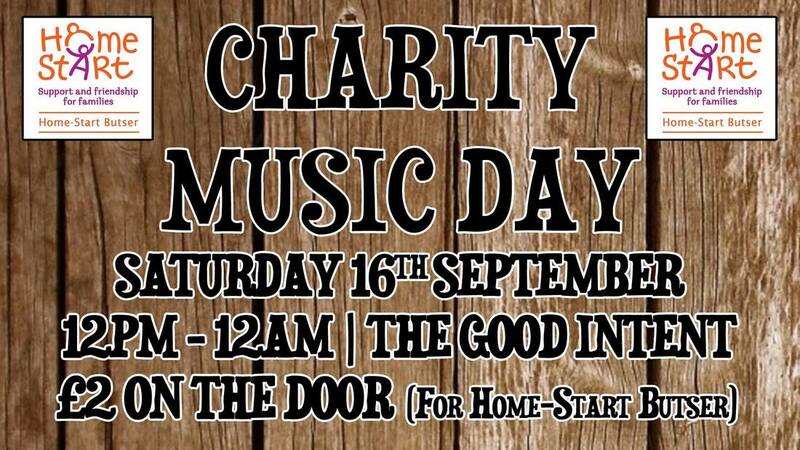 SATURDAY 16TH SEPTEMBER @ What's On at the Good Intent, PETERSFIELD 12NOON - 11PM WITH JUICY LUICY HEADLINING!! WE'RE BACK AT VICTORIOUS FESTIVAL!!!!!! 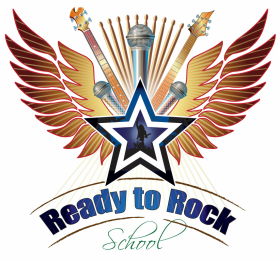 THE READY TO ROCK SCHOOL COLLECTIVE IS BACK AT V.F.!!! PORTSMOUTH F.C LEGENDS vs TEAM MARLOWE FUNDRAISER!! The 'Can you help with any music?' 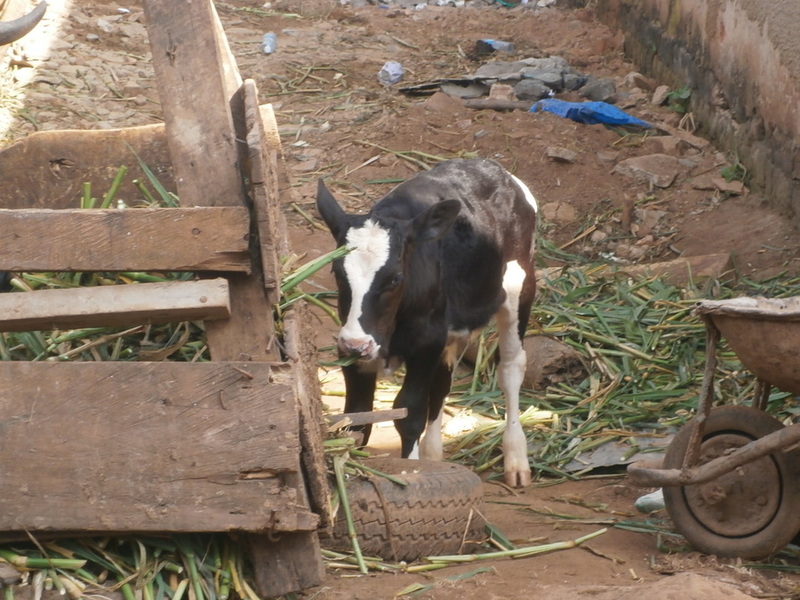 call came in and the RTR COLLECTIVE offer of help was there like a flash!! Stalls, bouncy castle, face painting, raffle, P.F.C. memorabilia auction, food, drink and some rather damn fine music in the club too! What a TOP afternoon in store all in aid of little Marlowe! A lovely message from Terry and Louise Mills from MED3MUSIC after my visit down to Portsmouth, to donate the proceeds from our Hayling gig. What a real treat to sit and listen to the group members' original songs...and then Terry got me up to sing...hadn't done that with him in nearly 30 years! "A huge thank you to Mark Thompson-Smith and The Ready To Rockers from Portsmouth, Petersfield, Havant and Waterlooville who played their hearts out for 6 hours on Sunday at their Summer Charity Rock Gig raising a fantastic £230 for Med3 Music. WHAT A FANTASTIC DAY AT HAYLING!!! I know that I always say how great our gig days are but this was the best so far for so many reasons and backed up from the feedback that we've received on the day and since....FANTASTIC!! So many highlights from the students from across all of our schools in front of an ever larger crowd....and the sun came out too! Despite the sun cream application I was still sunburt! It really was a top day with funds being raised for MED3MUSIC www.facebook.com/Med3Music...cash donations on the day of £220 then a further £10 from my Mum, bless her. Our students of all ages had so much fun across the 6 hours of performances but this photo sums up the adults' feelings on the day!! Lee 'Rock God' MacDonald & Paul 'Drop Bear' Clark!! Brilliant!! THE SUN'S OUT....THAT MUST BE HAYLING ON THE HORIZON THEN!!! THE J.A.R. & THE RTR SCHOOL COLLECTIVE'S ON THE MARCH!! 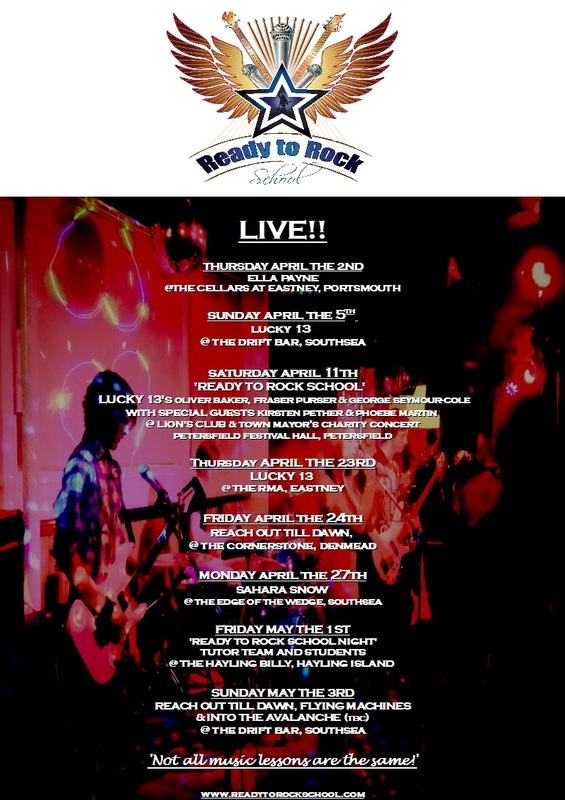 RTR'S latest band's out playing this weekend and join's the ranks of the Ready To Rock School Collective!!! WHAT ANOTHER GREAT DAY @WORKIES!!! Thank you for coming in earlier in the week. I have attached a photograph that Howard took for us. I have scheduled to share that photo on our social media platforms tomorrow please feel free to share it too. The buckets contained a £69.87 making a fantastic grand total of £555.87! That absolutely brilliant total could fund 8 pre-school sessions with our specialised Teachers of the deaf. A huge thank you for all the hard work that went into organising this event. I have attached an updated copy certificate which you might like to share with the Ready to Rock Community. I would like to send you a hard copy but I don’t currently have your address, if you could send it to me I will get that in the post asap. From everyone at The Elizabeth Foundation a huge thank you again for all the hard work that went into the Ready to Rock Event. IT'S SPRING!!! IT MUST BE WORKIES!!!! WHAT A FANTASTIC DAY AT THE WEDGE!!! WHAT AN ABSOLUTELY AMAZING DAY AT THE WEDGEWOOD ROOMS!! It really was....a fantastic pro. set up by all of the RTR and Wedge teams, the doors opened and people started to flood in!! 273 through the doors with the students and tutor teams making over 320 in all!! The band performances were top drawer and our newbies conquered their nervous excitement to take the stage and subsequent applause!! Well done all of you. We managed to raise a grand total of £1440 from ticket sales and donations....what a result!! Many thanks to Geoff Priestly and his team for hosting us again and Geoff's already booked us back in again for next year...thanks you, sir! Gail's memory was wonderfully honoured with both Joe and sister, Jess in attendance. Jess and I handed over the cheque to Julie Kill from the Macmillan Cancer Information and Support Centre at Q.A Hospital (Cosham)....she was delighted to receive it and offered her thanks to all involved. Yes, excitement abounds at Ready To Rock School as we return to Mr Priestley's TOP venue in Southsea for another rock marathon!! 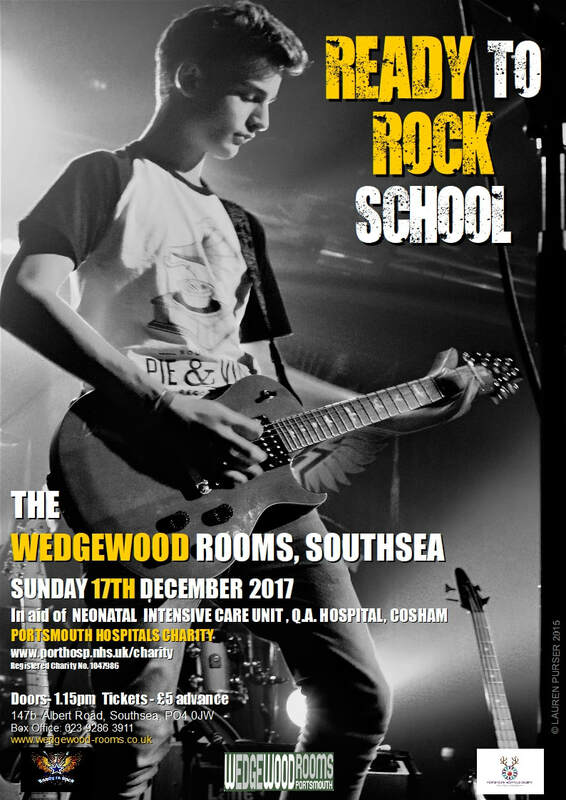 The RTR young, teenage and adult rockers from our Portsmouth, Petersfield, Havant and Waterlooville schools are putting on their Christmas charity gig full of TOTAL ROCK songs from across the decades. Gail's son, Joe, had been one of our longest standing guitar students at Portsmouth and I know that his weekly lessons and his love of rock music helped to ease some of the autistic challenges he faces in his daily life.Gail totally supported Joe with this and her truly tragic and swift passing is a bitter blow...she really was a lovely lady. As such, the afternoon will be an appropriate way to celebrate Gail's life as she loved live music and seeing Joe play on stage with us. I'm sure that she will be with us in spirit supporting us all. 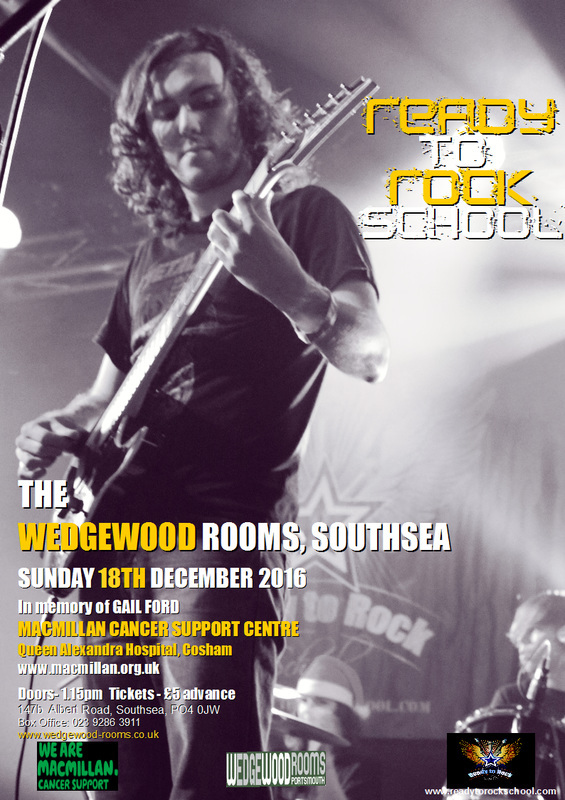 Tickets are £5 in advance and are available via the rock schools and The Wedge's box office. READY TO ROCK SCHOOL ARE......READY TO ROCK!! A great session with our Havant rock school last night preparing our youngest rockers for their gig at LOVE BAFFINS CHRISTMAS MARKET this Saturday! Come on down to The Baffins Pub...two great bands from 11am to 1pm then students from Portsmouth College and Ready To Rock School throughout the afternoon!! WHERE DID THAT DECADE GO THEN???!!! Yes, unbelievably, today marks the 10th anniversary of Ann and I opening up rock schools in Hampshire, England!! Initially, under the Clive's Easylearn franchise banner and then under our own Ready To Rock School flag when the former company liquidated, we, along with the many fantastic tutors in our team, have somehow arrived at this rather amazing milestone... I'm not sure how we managed to make it to this point but we did!! It's definitely been a rock and roller coaster particularly during the recession with the accompanying financial and personal issues which I won't bore you with but, throughout, our belief in passing on the rock baton to all of our students who have started their own music based race, has never wavered. My eternal thanks to all of the tutor team members past and present, to over 320 previous and current wonderful students who have attended/are attending our schools, to all of the ever supportive parents throughout, to the welcoming venues and their representatives, to Jenny and the Nevada team for their support, Nic Lipscombe for the artwork, Anita, Kayleigh, Kate, Olly and Lauren for the photos, Steve, Dave and Loz for their desk twiddling and to all of the remarkable charities who have provided us with an opportunity to help in our small way whilst adding a constant sobering perspective to our lives too. ​My final and eternal heartfelt 'Thank you' goes to Ann who has supported me through some of my darkest times in order for us to continue running the schools...she is, with full pun intended, 'my rock' and with her and Rachel's love and undiminished backing we keep it all rolling on! I'm truly, truly privileged to continue to be a part of this magical musical world of learning, playing and achieving.....TEN YEARS??!! ANOTHER ROCKING WEEKEND @HORNDEAN'S MERCHISTOUN HALL SUMMER FAIR!! Well, what a brilliant couple of weekends we've had at Waterlooville and Victorious Festival....quite amazing!! More on that to follow....BUT there's more fun to be had this weekend too ....yet another opportunity for some more of our students to shine! VICTORIOUS KIDS....ARE YOU READY TO ROCK???!!! VICTORIOUS KIDS.....ARE YOU READY TO ROCK???!!! Are you and your young rock fans going to Victorious Festival??? 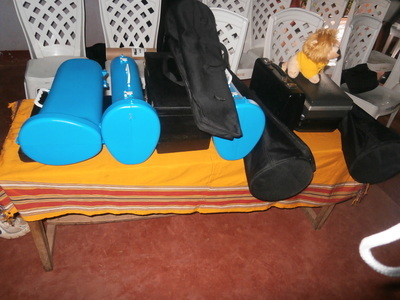 READY TO ROCK SCHOOL'S 'bringing the noize!' 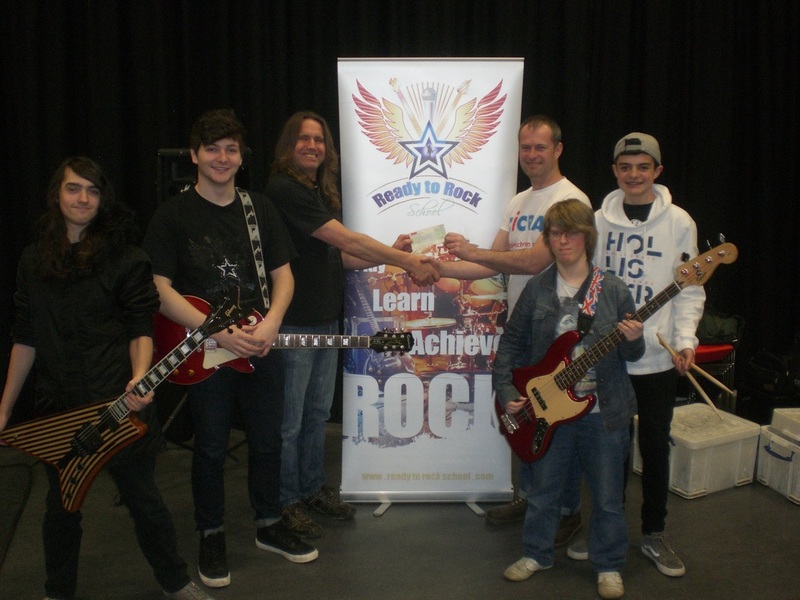 to the Kids Arena and giving aspiring young rockers, between the ages of 8 and 15, the chance to get up and 'rock out' with our excellent RTR tutors!! We might even get one or two of the Mums and Dads up too... after all, you are never too old to rock and roll!! We'll also be featuring some of our top young students, including the mighty LUCKY 13, just to show you what's possible when you join one of our four local rock schools. Want to be involved? We're starting to book young rockers in for the Victorious weekend slots now via our Contact Form! READY TO ROCK SCHOOL's all over Waterlooville on the 20th & 21st of August!! Local favourites Marmalade Moonshine headline at 1.15pm. 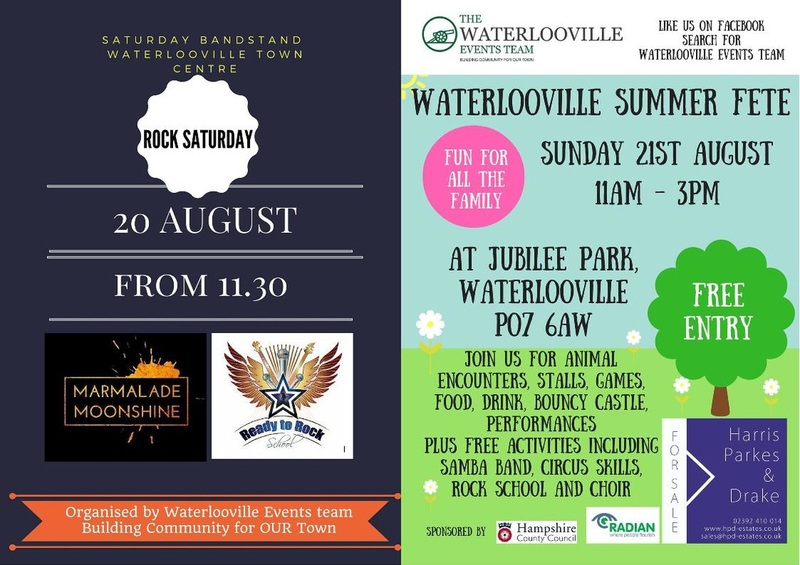 Next day, it's the full RTR Collective experience with bands and the Rock Roadshow at Waterlooville Fete, over at the Recreation Ground, from 11am to 4pm. LUCKY 13 is on at 1.30pm Charlotte's new band....which at the moment is called CHARLOTTE'S NEW BAND!! :)...they're on at 2.45pm. ​THE RTR SCHOOL COLLECTIVE'S AT DENMEAD'S MIDSUMMER PARTY!!! Another great opportunity to catch up with all things Ready To Rock School this Friday evening, June the 24th!! 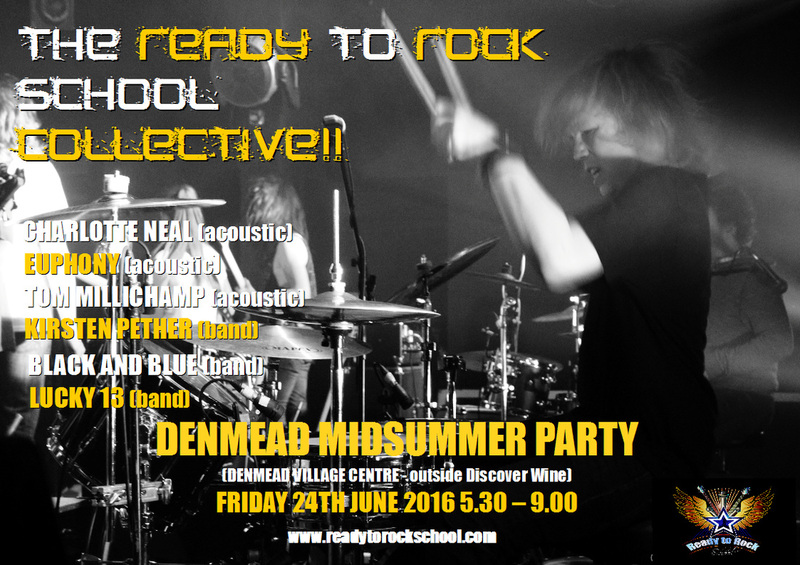 The READY TO ROCK SCHOOL COLLECTIVE appears at Denmead's Midsummer Party from 5.30pm onwards with acoustic acts and bands playing up until 9.00pm. The RTR students and tutors are joined by special guest, Tom Millichamp, with LUCKY 13 headlining the bill. 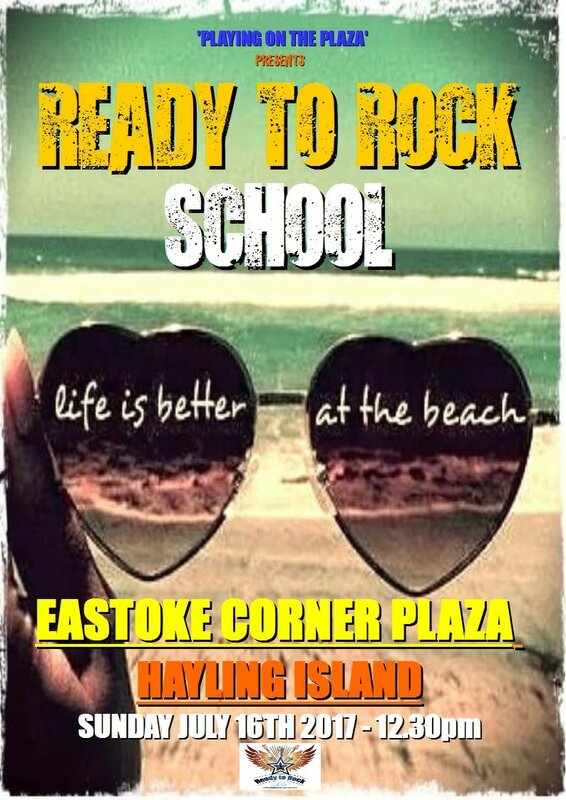 Yes, get your buckets and spades out of the cupboards....we're back at Hayling Island for another FANTASTIC summer gig at Hayling Island's Eastoke Plaza!! Open Sight is the largest charitable organisation in Hampshire working with people who have, or who are at risk of developing sight loss. Based in Eastleigh, Open Sight has provided uninterrupted support to the blind and partially sighted community of Hampshire since 1922. 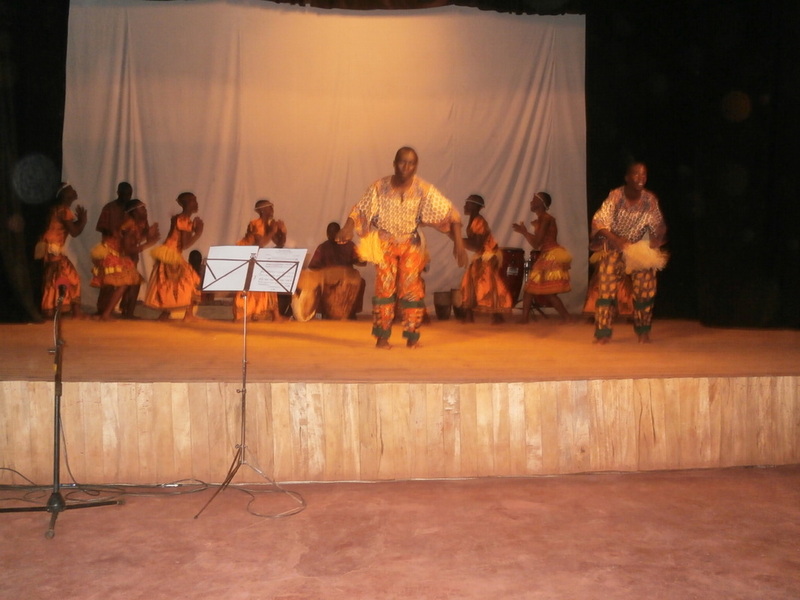 The charity has been suggested by one of our student's parents to raise awareness of all of the good works that they do. Come on down and support us....the sun's booked so DON'T FORGET YOUR SUN CREAM!!! Maddi popped in to the Havant rock school last night, with Shelly Reid, Louis Bastable and Spencer Crockford, to say a final 'Thank You' for helping to raise £350.08 towards her funds last month. LATEST NEWS JUST IN!!! WE'RE AT VICTORIOUS FESTIVAL!!! Yes, we've been kindly invited to 'BRING THE NOISE!!' to the fabulous VICTORIOUS FESTIVAL 2016 on Southsea seafront!!! ​The READY TO ROCK SCHOOL ROADSHOW will be barrelling in to the Family and Children's area to give the young festival goers, a chance to get up with the tutor team and 'PLAY IN A ROCK BAND', at one of the BIGGEST and most EXCITING music festivals in the UK. ​60,000 people are expected each day of the August Bank Holiday weekend festival, not only to see a fantastic array of bands and artists, including headliners, Noel Gallagher's High Flying Birds and Manic Street Preachers....but ALSO to see these lucky new ROCK STAR contenders play too!! What a buzz for them to be able to say 'I played at The Victorious Festival with Ready To Rock School!!' ...who knows where that may lead them? ?.....maybe to play on the bigger stages at the festival in the future, just like our leading lights LUCKY13, who played at Victorious 2014 and are back this year to play in front of an even bigger crowd, ...we'll get them over to the RTR School marquee to show you what they can do too!! READY TO ROCK SCHOOL TO THE RESCUE!! .....and in the 'Break Glass In Case Of Emergency' category ...the Ready To Rock School Collective comes to the rescue!! A NIGHT OF BOWIE....AND WHAT A NIGHT!! What an extraordinary night at the Wedgewood Rooms for Ella and I as we were both invited to be part of, what turned out to be, one of the most special evenings that The Wedgewood Rooms has ever hosted. What a privilege to be a part of this amazing, AMAZING night. 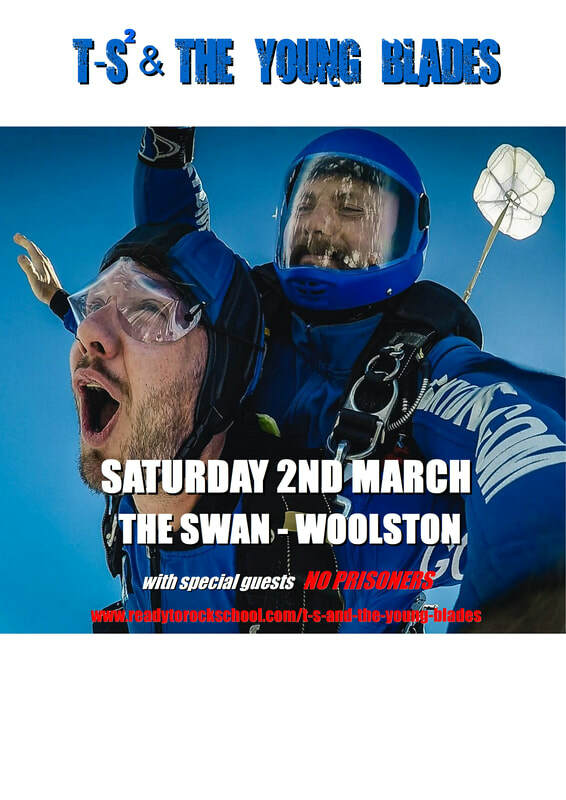 A charity tribute night for one of the worlds top rock icons, featuring a whole host of fantastic musicians from the local area and led by the 'man with the plan', Mr Paul Caruana from Casemates Rehearsal Studios. In tandem with Geoff Priestly from 'The Wedge', Paul organised, at short notice, a great house band and sent out invitations to bands, solo artists and singers to perform a whole show's worth of Bowie's songs from across the decades... a very tall order! The show sold out rapidly and could have sold out twice over such was the demand for the tickets and far exceeded everybody's expectations....an incredible night! .​...and we're back @WORKIES!!! Must be Spring then!! adult rockers from their Havant, Waterlooville, Portsmouth and Petersfield schools. Nine great bands and fantastic solo acts will be performing a whole host of rock songs from across the decades, with all proceeds in aid of Maddi Crockford-Reid's Miracle4Maddi fund. A fantastic Saturday in Southsea ahead, with ICEBREAKER 2016!! ...10 venues, over a hundred bands and solo acts, the after show party and a silent disco at The Wedge too...ALL FOR A TENNER?? THAT'S RIDICULOUS!!! ​...and FINALLY, we get to present the cheque...£972.96 raised at our Wedgewood Rooms gig ...a fantastic effort...thank you again to all involved!! A truly amazing day throughout, from the youngest to the oldest bands, at The Wedgewood Rooms yesterday raising funds for CICRA www.cicra.org!! So many fantastic performances from across the 4 schools...but this final one, early on, from the youngest ones from Petersfield, summed it all up....huge smiles, even more huge smiles, loud cheers and even louder cheers from start to finish! ​Thank you so very much to all of the students, the parents, families, friends and the mildly curious that attended to create a fantastic atmosphere. Lucky 13, you were tremendous once again! A big THANK YOU to the Ready To Rock School team, namely, Olly Browning​, Matt Tiger Purkis​, Edward Cole​, Chris Latter​, Luis Abram​, Joe Booley​ and our 'Break Glass In Case Of Emergency' David Bicheno-Samways​ along with Mr Steve Browning​...and Molly too! a MASSIVE THANK YOU to Lauren purser for the amazing photos...fantastic!! 5 FULL HOURS OF 'ROCKAGE'!!... It's a veritable smorgasbord of rock delights....and all for the ridiculously ludicrous price of £4!!!! LUCKY 13.....A FANTASTIC RESULT...RUNNERS UP!!! WELL DONE, LUCKY 13...A VERY WELL DESERVED 2ND PLACE!! ​Absolutely blown away by last night's performance at The Wedgewood Rooms Showcase '15 Final in Southsea!! 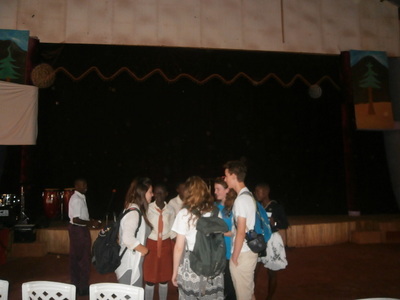 ​Half of the much older bands were intimidated by the occasion ...not Ella, Fraser, George or Olly!! Age is no barrier and Ella, Olly, George and Fraser go from strength to strength...through to the final against much older competition!!! A fantastic new addition to the local summer music scene.... GULLFEST 2015!! SATURDAY THE 5TH OF SEPTEMBER @THE SEAGULL, PORTCHESTER in aid of MACMILLAN CANCER SUPPORT. We've been invited to be a part of proceedings so we're sending in the RTR School 'Leaders of The Pack'...LUCKY 13!! A GREAT DAY, GREAT CAUSE AND A WHOLE LOT OF LOCAL ROCK TOO!! LUCKY 13'S ON A ROLL...GIGGING...GIGGING & WINNING!!! Our leading lights are gigging like crazy at the moment with a run of 8 gigs including a fantastic 'WIN' @THE WEDGEWOOD ROOMS in SOUTHSEA on August the 20th. They are now through to the semi final on Wednesday September the 2nd ....fantastic!! Tickets are available from the band and the WR website or on the door! When 'one of your own' is in trouble, you automatically offer a helping hand and our local musos are doing just that in abundance, on SUNDAY THE 16TH OF AUGUST, with the 2nd ROCK 4 RUSS fund raising gig @.THE HEROES in WATERLOOVILLE. The event is in aid of drummer and all round top man, Russ Mahoney, formerly of YOYO, THE CHAPS, JELLYBEANS, COUNTY LINE, FLIPTOP and BRIAN CONNOLLY'S SWEET, to assist him with the costs of his stem cell operation, after suffering a stroke 4 years back which has caused the paralysis of his left arm. This time, Tony Coles at The Heroes, has offered his fine venue and the following bands and musos have rallied to the call to help. PEACH & THE NEW BEATS - REACH OUT TILL DAWN - LUCKY 13 - HAZZARD COUNTY - THE BERNDASHIANS - READY TO ROCK SCHOOL - THE MEN FROM MONTGOMERY - THE SUPERHEROES - T-S & THE YOUNG BLADES - DR ROCK (members of THUNDERSTRUCK) - PJ (FLIPTOP) - RITCHIE (MAFIA) - TOBY & ROBBIE (MONSTER) ... and MANY MORE!! It all kicks off at 1.30pm .....it's FREE ENTRY but donations on the the day are very welcome!! Please lend your support, share with your friends and let's make this another great day for Russ!! ....and before you know it...WE'RE BACK @THE BILLY! 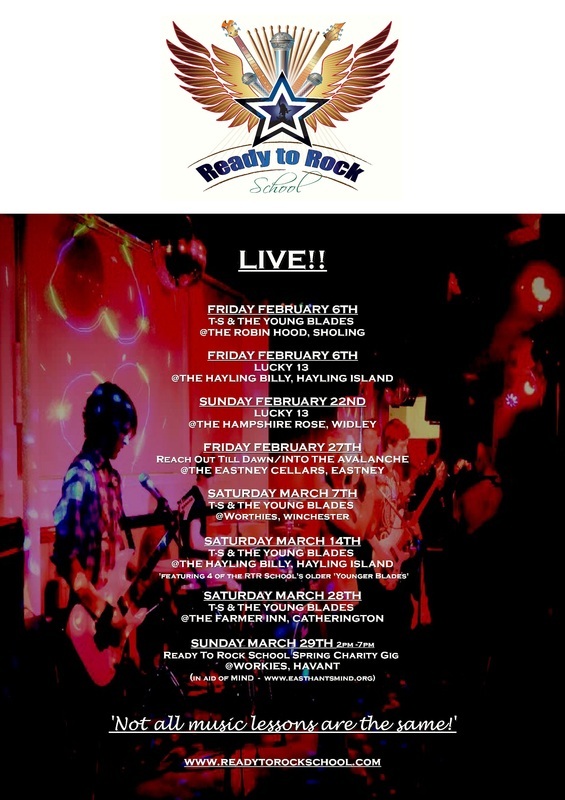 Yes, in short order, the READY TO ROCK SCHOOL COLLECTIVE is back on Hayling Island, at The Hayling Billy! FRIDAY AUGUST THE 14TH sees the return of READY TO ROCK SCHOOL NIGHT featuring RTR's own JOE BOOLEY with his acoustic set and then RTR'S MATT PURKIS with the premiere of his new blues band, BLACK AND BLUE BAND. The evening continues with students and tutors combining for another exciting set of rock songs to take you up to witching hour! The following day sees more bands from the Ready To Rock School Collective firmly in evidence @The Hayling Billy's Summer Party, namely LUCKY 13, THE DROP BEARS and REACH OUT TILL DAWN, raising money for ROWAN'S HOSPICE in Purbrook. RAIN DIDN'T STOP PLAY @HAYLING!! Sadly, our plans for a 3rd visit to Hayling Island's Eastoke Corner seafront was well and truly scuppered by the rain but fear not...PLAN B came in to play. Landlady, Mandy and manager, Martin, offered us the opportunity to play at that fine pub, The Hayling Billy and the gig was rescued. We all rushed down, set up the smaller gear in quick fashion and everyone squeezed in for the whole afternoon!! What a great turn around to avoid a disastrous cancellation...and what a great time was had by all!!! Well done, everyone and thank you again, Mandy and Martin! The ladies from The Samaritans raised £177.73 during the afternoon! 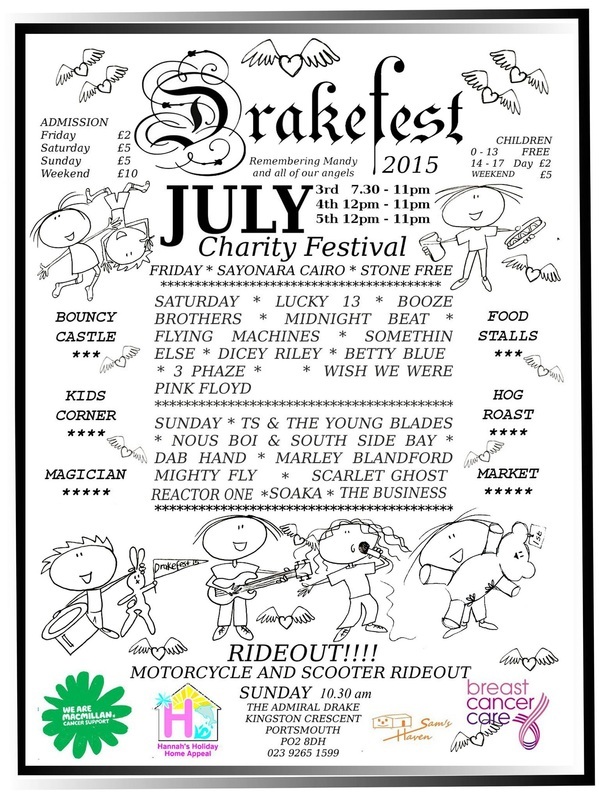 take to the DRAKEFEST stages this weekend i.e. 3rd/4th/5th of July. Held at THE ADMIRAL DRAKE, RUDMORE ROUNDABOUT, PORTSMOUTH, this annual charity music festival brings in the best of the rock bands from the Portsmouth and surrounding areas. Again, DRAKEFEST is raising money for vital charities, namely, MACMILLAN CANCER SUPPORT, SAM'S HAVEN, BREAST CANCER CARE & HANNAH'S HOLIDAY HOMES APPEAL. We're delighted to be involved this year, particularly LUCKY 13, who are stepping up a level to the Outside Stage after amazing everybody last year inside The Drake. This is another triumph for George and Fraser from LUCKY 13..... 4 years back they were with us at a rock roadshow at DRAKEFEST 2011 jamming some of our simpler rock songs! To say that they have progressed way above that now is a definite understatement!! HAYLING ROCKS!! JULY THE 12TH 2015 - HAYLING ISLAND!! Good grief....the merest hint of sunshine and all roads point to READY TO ROCK SCHOOL'S SUMMER CHARITY GIG...ON HAYLING!!! We'll be collecting for The Samaritans www.samaritans.org this year as suggested by one of our parents and we'll be doing our level best to raise as much money as possible with your help again. 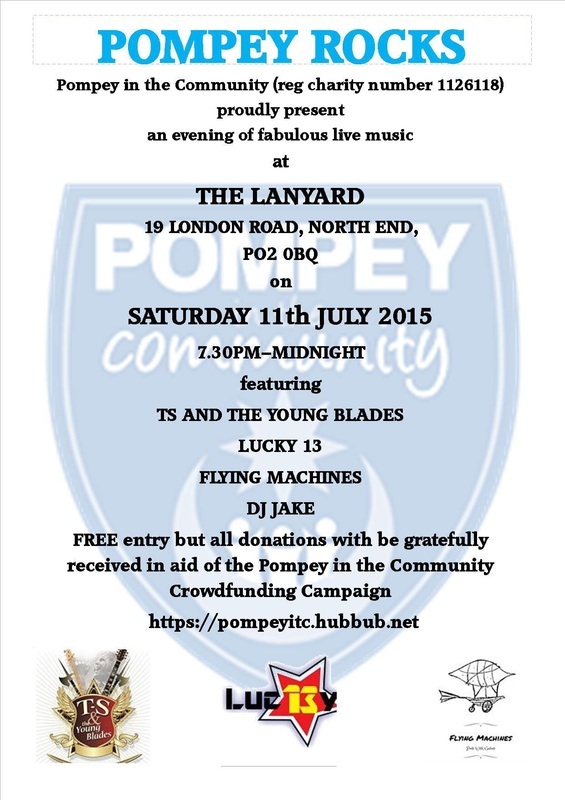 LUCKY 13, FLYING MACHINES & T-S & THE YOUNG BLADES IN POMPEY x2!! T-S & THE YOUNG BLADES PLUS SPECIAL GUESTS LUCKY 13!! 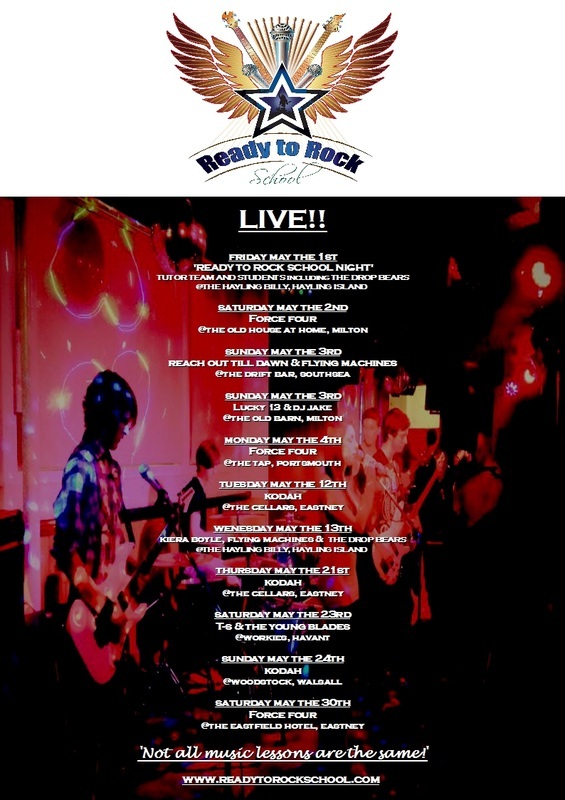 May Bank Holiday Weekend on the horizon and two great seaside gig nights coming up featuring a 'goodly' number of the Ready To Rock School Collective. First up, READY TO ROCK SCHOOL NIGHT on FRIDAY THE 1ST OF MAY @THE HAYLING BILLY, HAYLING ISLAND, with a fine selection of the RTR tutors and students from across the 4 schools, including Miss Ella Payne from Lucky 13 and the debut of Paul Clark and Nick Randall's new band of brothers, THE DROP BEARS! Following up on the 3rd, Will ChuMp's top Bank Holiday Sunday night gig @DRIFT BAR, SOUTHSEA featuring Markus Smith and his FLYING MACHINES, Kiera Boyle's INTO THE AVALANCHE and headliners, REACH OUT TILL DAWN featuring Chris Fifi Latter, Evan Latter, Max Salgado-nacke, Jack Wilmshurst and Laura Forbes! What a great RTR bank holiday weekend ahead!! RTR STUDENTS SET UP THEIR OWN GIG!! Ready To Rock School students, from our Havant and Waterlooville schools, are putting on their own gig at THE CORNERSTONE, in Denmead, on FRIDAY APRIL THE 24TH. Drum student, Chris Latter, is organising a FREE gig at the former Mead End pub with his band, REACH OUT TILL DAWN headlining the evening. Along with lead guitarist brother Evan, bassist Jack Wilmshurst, rhythm guitarist, Max Salgado-Nacke and vocalist Laura Forbes, the band have invited INTO THE AVALANCHE, fronted by RTR vocal tutor, Kiera Boyle and also SAD CAESAR to open the event. 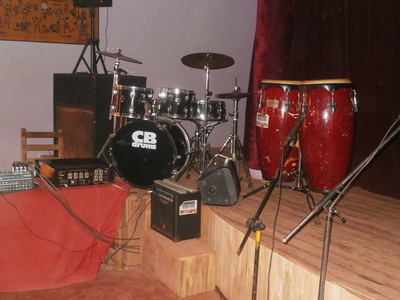 The gig is sponsored by Sundaes Cafe at The Cornerstone. Doors open at 7pm with an OPEN MIC from 10pm. That very nice man, Ross Borman, from Havant and East Hants MIND, came over to Havant Academy and met the Ready To Rock School team and Havant students. Jack Cotten presented Ross with our £491.66 cheque, from our charity gig at Workies, flanked by Luis Abram and Louis Bastable...and Louis's new guitar ...we just had to get that in the photo too!! RAISING THE ROOF AT THE PETERSFIELD FESTIVAL HALL!! Ready To Rockers from LUCKY 13, George, Oliver and Fraser certainly raised the roof and made the 280 strong audience take full notice on Saturday the 11th, as they performed a fantastic set with guest vocalists, KIRSTEN PETHER and PHOEBE MARTIN, both students from our Waterlooville school. Ready To Rock School students and tutors out on manoeuvres!! ............must be time for our Spring Charity Gig!! WORKIES in HAVANT on SUNDAY THE 29TH of MARCH!! 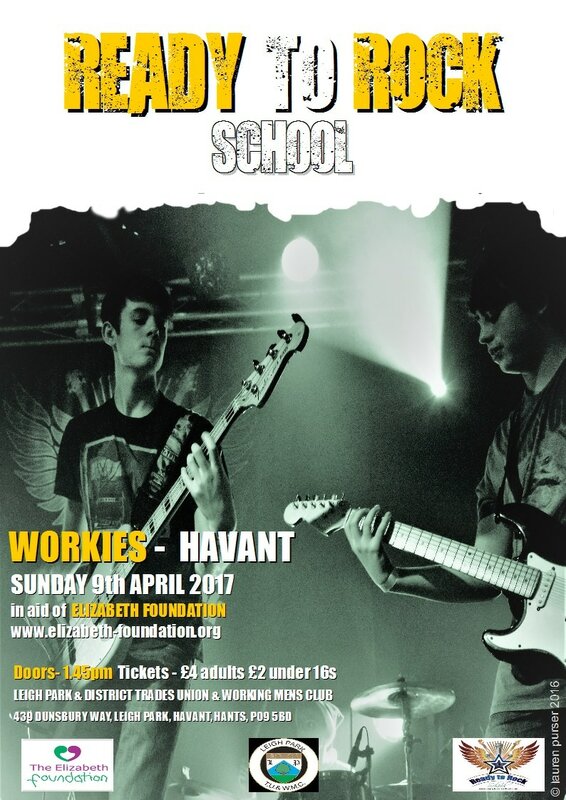 10 bands and solo artists, from the four rock schools based in Havant, Waterlooville, Portsmouth and Petersfield, will be entertaining the 200 strong crowd with another exciting collection of rock songs from bands across the decades. ...and the gigs keep a'coming!! Well, what a fantastic end of year gig we had at Petersfield Social Club ...great performances and a lot of fun! Thank you, once again, to all of you that attended and to all of you that played. With your help we raised £310.80 for the Rosemary Foundation and we were able to present the cheque to the some of the wonderful RF team earlier this month. New Year's Eve was also a Ready To Rock School based event, with The Young Blades accompanying me at The Wheelwright's Arms in Havant, with not only Tim, Mark and Olly firing on all cylinders but we had Jack holding the drum fort for Russell too....top man! Not only that, but we had students Rachel T-S, Ella, George and Fraser up for a few songs too, with their families in attendance before we saw in the new year in grand style...it was like our own little rock club at the back of the pub...a great night had by all!! So..... we're in to 2015....let's make it as much fun as last year.....let's rock!!!!! HAYLING NIGHTS - a double header on Hayling Island!! So, SATURDAY DECEMBER the 6TH, sees REACH OUT TILL DAWN, LUCKY 13, MISS ELLA PAYNE and the Springwood Centre's own THE ASH performing in the main hall, 6.15 PM TO 10PM. Tickets are £2.50 in advance, £3.00 on the door, from the Springwood Centre office. Ages 12 years to 18 years with Motiv 8 & Springwood Centre staff supervision. NOT ALL MUSIC LESSONS ARE THE SAME!! GOOD LORD, WE'VE GONE PLAYING MAD!!!!! Yes, the READY TO ROCK community seem to have hit a purple patch of gigs!! Students, student bands and the tutors are all out and about playing ....fantastic!! Gigs in Portsmouth, Fareham, Hayling Island, Waterlooville, Petersfield and Havant too in the next 7 weeks!! An extraordinary burst of activity from us all...so much fun....want be part of the best way to learn?? Apply for a FREE TASTER...you know it makes sense!! READY TO ROCKERS AT THE HAYLING BILLY!! Ready to Rockers at The Billy on Friday November the 21st!!! As a result of LUCKY 13's highly successful showcase evening at The Hayling Billy, back in August, we've been asked by manager Martin to bring in even more of our students for one of their main evenings. So, we have LUCKY 13 & REACH OUT TILL DAWN co-headlining and more of our senior students in with the tutors to show the Billy crowd what they can do...what a top evening ahead!! REACH OUT TILL DAWN & LUCKY 13 ROCK KINGSLEY'S @SOUTHSEA FOR SAMUEL!! ﻿﻿....and now they are organising joint gigs!! Yes, REACH OUT TILL DAWN and LUCKY 13 are jointly organising a gig at KINGSLEY'S in SOUTHSEA on WEDNESDAY THE 29TH of OCTOBER...luckily it's half term!! With Ella opening up proceeding with a short acoustic set of originals and covers the Ready To Rockers are showcasing new songs to all in attendance. A prize raffle will be also be held to add to the donations. The night kicks off at 7.30pm!! FREE ADMISSION!!! Natalie Bettinson, Alzheimer's Society area representative visited our Waterlooville school and accepted a cheque for £898 from RTR students, Jack Wilmshurst and Chris & Evan Latter from REACH OUT TILL DAWN. Natalie expressed her hearfelt gratitude to all who attended the ROCK ORIGINALS night and those that played their part in performing on the night...she also stayed for the guys jam song ...she was mightily impressed...well done guys!! Hot on the heels of LUCKY 13 are REACH OUT TILL DAWN featuring four of our RTR students, namely Evan & Chris Latter, Jack Wilmshurst from our Waterlooville school and Max Salgado-Nacke from our Havant school and joined by vocalist, Laura Forbes. 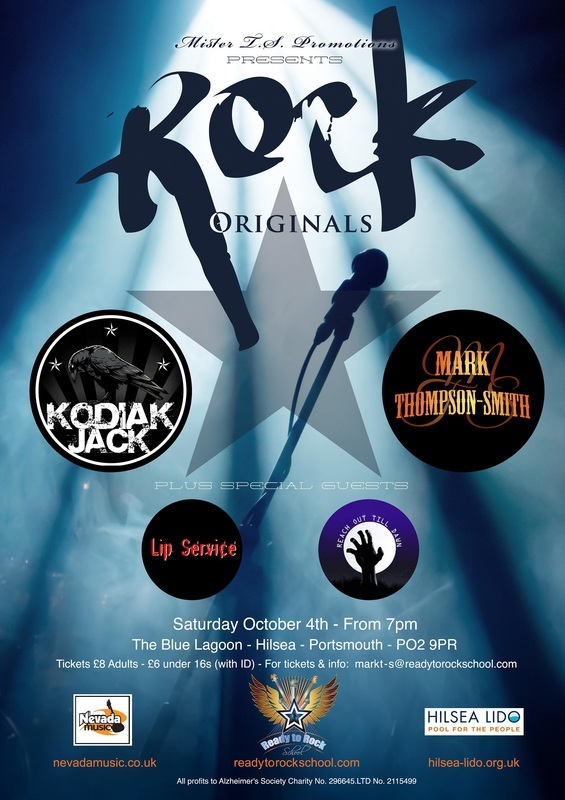 Along with LIP SERVICE, the MT-S COLLECTIVE and headliners, KODIAK JACK featuring former Petersfield student, Kieran Bellinger, the night is guaranteed to be a fantastic evening of original rock!! What an absolutely extraordinary weekend for the Ready To Rockers from Petersfield & Portsmouth schools and for music events in Hampshire as a whole! The Victorious Festival was an absolute triumph for the organisers, the council, for the bands, the solo artists and for the 80,000 happy, smiling people who attended over the weekend....and particularly for LUCKY 13 who pulled in a great crowd at the CASEMATES STAGE amazing all with a terrific performance of originals and covers. WHAT A PACKED WEEKEND AHEAD! A fantastic day ahead for our Ready To Rockers on Sunday August the 24th!! The Petersfield students are performing at The Square, as part of the Petersfield Summer Festival, at 12.15pm and LUCKY 13 from Portsmouth are also performing at the Victorious Festival on Southsea Common, at 11.15am...what a great day for all of them!!! WESSEX HEARTBEAT ACCEPTS OUR CHEQUE! Wessex Heartbeat representative Sandra Cooper came down to our Waterlooville rock school to see and accepted our cheque for £214.45. A lovely letter of thanks to all the team, students and all who donated on the day was handed to me along with a very nice certificate too. THE HAYLING WEATHER GODS MUST LOVE US!! What another extraordinary day at Eastoke Plaza! 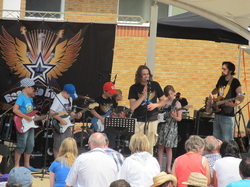 I thought last year was amazing but it truly was another brilliant afternoon in the stunning sunshine, with an even bigger crowd avidly watching the students rock their socks off all afternoon. Fantastic performances throughout, all topped off with a great headlining set by REACH OUT TILL DAWN...first gig out...great potential!! Well done, Laura, well done guys! WE'RE GOING BACK TO HAYLING!!! 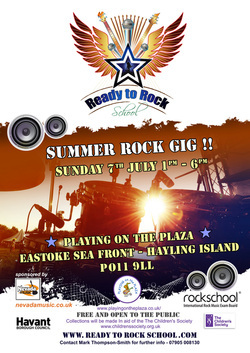 Yes, SUNDAY JULY THE 13TH sees the return of the the Ready to Rockers, young uns, teenagers and slightly more mature ones too, to the scene of last year's amazing day at Hayling Island's Eastoke Seafront ...probably the best weather you could ever wish for last year with the students from the 4 RTR schools entertaining the sun drenched crowds for a full 5 hours...a truly brilliant, brilliant day! We've been invited back as part of the PLAYING ON THE PLAZA season so, put it in your diary...SUNDAY JULY THE 13TH for sun, sea, beach, play park for the little ones, 2 pubs for the older ones across the road with an award winning fish and chip shop and an ice cream parlour to die for too all with the Ready To Rock Students playing their hearts out all afternoon for you, all in aid of WESSEX HEARTBEAT www.heartbeat.co.uk...it's a win, win, win, win, win, win situation all round!! This huge festival is being held in Southsea, on August the 23rd and 24th and the young Ready To Rockers, from our Portsmouth school, have a slot on the Casemates Showcase Stage on Sunday the 24th...I am ecstatic!! Well done, Oliver, Fraser, George and Ella!! 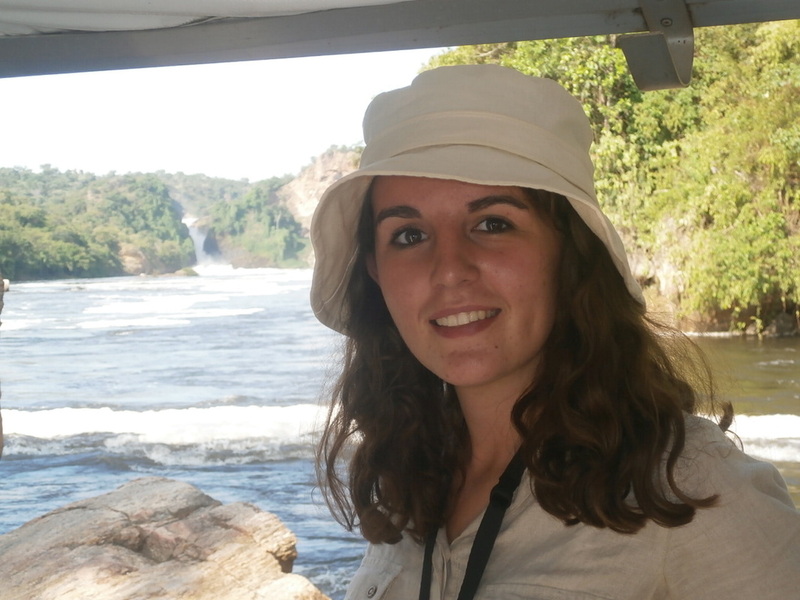 CHARLOTTE'S OFF TO UGANDA WITH A BAG OF MUSICAL GOODIES!! A wonderful gig once again and a fantastic response from the parents and members of Workies. £533.99 in donations all going towards the TENDER TALENTS MAGNET SCHOOL in Kampala, Uganda. The cheque has duly been handed over to Miss Charlotte Randall, one of our Waterlooville drum students and she, along with her Portsmouth Grammar School classmates, will be taking over a collection of new musical instruments in the summer. IF IT'S SPRING...IT MUST BE WORKIES!!! Yes, the rain's finally stopped and the sun's out...must be Spring!!! ...that must also mean, it's time for another Ready To Rock School Charity Gig!! Those marvelous people at Workies in Havant have invited us back again for another 5 hours of rock excitement from our students on SUNDAY APRIL THE 6TH. We've another fun packed and inspiring afternoon of rock stars playing their hearts out for all and sundry. 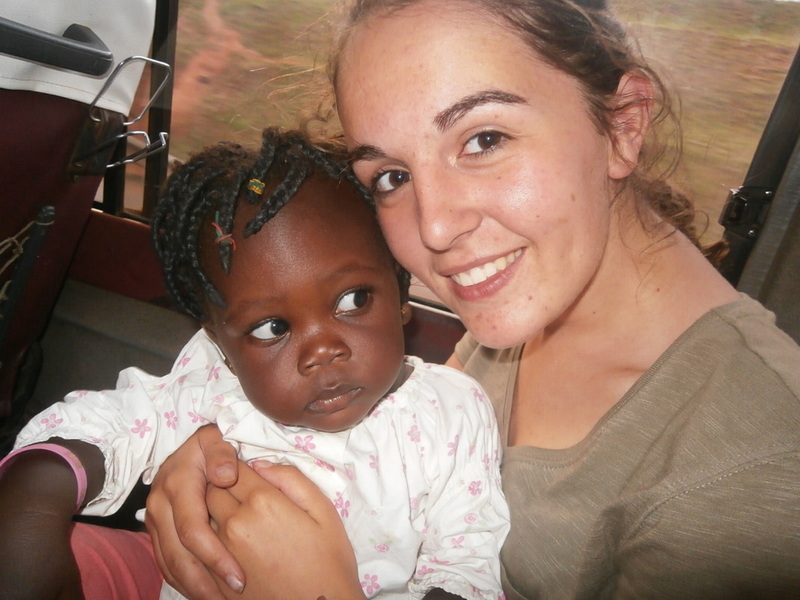 Our fund raising this time goes 'international' courtesy of our Waterlooville student, Charlotte Randall. 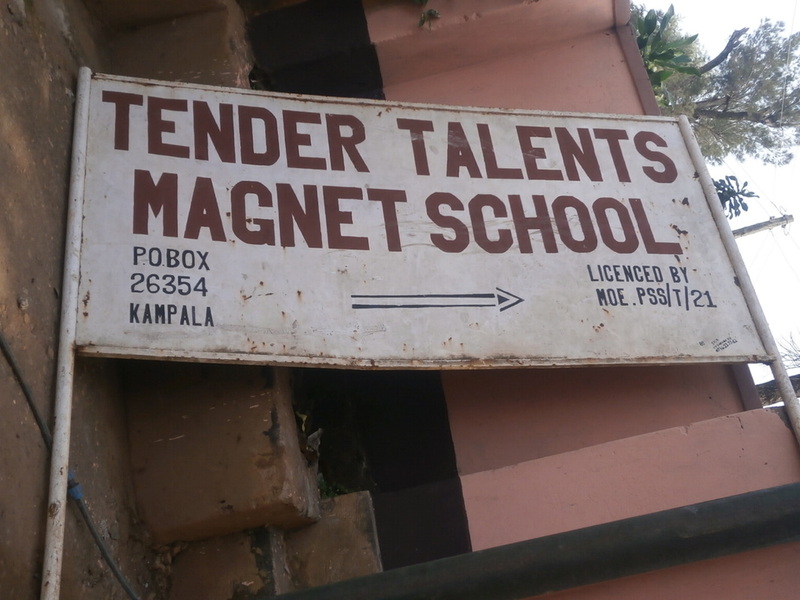 Charlotte, along with her Portsmouth Grammar School classmates are raising money to buy musical instruments for the Tender Talents Magnet School in Kampala, Uganda and we're delighted to join in with their efforts! LUCKY 13...that's a name that you're going to hear a lot around the South Coast over the next few years! George, Oliver, Fraser and Ella, from our Portsmouth School, are already out playing in the city with their own songs and impressing all, and I mean ALL, who see them with the skills that they've been learning at Ready To Rock School. They've had older bands who follow them on the bill quaking in their boots!! Fronted by Ella Payne, who is also playing her own solo gigs around the South, these wonderful students of ours are blazing a trail and are the prime example of what wonders music and creativity can achieve!! Yes, it's that time again and as the winter draws in we've a warming Sunday afternoon ahead of us full of fantastic performances from our marvelous students. This time we're at The Blue Lagoon in Hilsea, Portsmouth PO2 9PR on SUNDAY THE 15TH OF DECEMBER 2PM -7PM!! We've a full packed programme choc full of the best rock songs and a little softer side thrown in to cushion the blow to the senses! 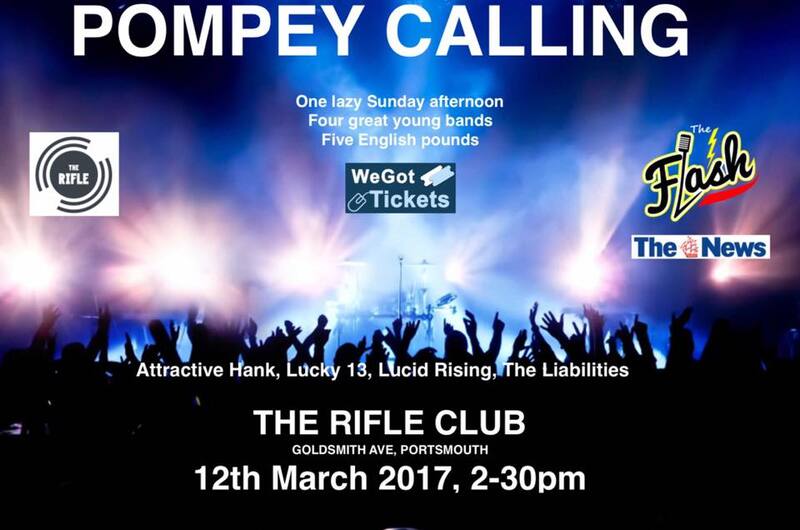 Not only that we have the young band prodigies who are currently astounding the Portsmouth musicians community, namely LUCKY 13 who are headlining the day with their selection of original songs...remarkable!! Tickets are limited and available in advance:-£3 for adults £2 Under 16s. The Children's Society's South East Co-ordinator Claire Cranfield accepts our cheque for £282.56 from the fabulous gig on Hayling Island . Thanks to all who came down to watch and also to those that contributed to The Children's Society collection buckets...£282!! Wonderful! Chic's GOOD TIMES wriiten by the gods of disco BERNIE EDWARDS (R.I.P.) & NILE RODGERS!! READY TO ROCK SCHOOLS AL FRESCO!! Summer's here...no, honestly it is, we had a brief glimpse of it last weekend so it must mean that the READY TO ROCK SCHOOL Summer Rock Gig is on its way!! on SUNDAY JULY THE 7TH 1PM TO 6PM!!! A fantastic afternoon with the Ready To Rockers playing songs from the likes of FOO FIGHTERS, THIN LIZZY, RISE AGAINST, THE SCORPIONS, MUSE, THE BLACK CROWES, PEARL JAM, IRON MAIDEN, THE KILLERS, CREAM, PARAMORE, VAN HALEN, NICKELBACK, LED ZEPPELIN, STEREOPHONICS, JOURNEY, LOST PROPHETS, FLEETWOOD MAC, SKUNK ANANSIE, DIO ...the list is literally endless!!! extra charge...now then, where are my shades?? Marc Bone hands over the cheque for £512.81 from our gig at Workies to the wonderful Cystic Fibrosis Unit Team from University Hospital Southampton. A marvellous group of caring professionals, a very worthy cause and an incredibly touching moment. 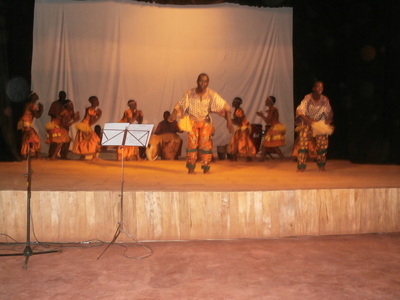 Charity Rock gig on March the 17th 2013. READY TO ROCK SCHOOL kicks off their official launch with a Sunday afternoon, jam packed with the very best in rock music and all performed by their very talented young students. The show is at the excellent Workies (Leigh Park Working Mens Club) venue in Dunsbury Way, Havant on Sunday March the 17th from 2pm www.workingmensclubleighpark.co.uk and provides the student bands with a brilliant opportunity to play on stage in front of a large and very appreciative audience whilst at the same time, help to raise money for a very worthy cause, namely, the Cystic Fibrosis Unit at the University Hospital Southampton. READY TO ROCK SCHOOL's Mark Thompson-Smith heads up the day and along with his fantastic tutor team, aim to ensure that that the RTR opening day goes with a real bang!! Mark said 'The gig at Workies on the 17th is going to be a great day not only for the students and the charity but also for the entire RTR team as we will be fully open for business for new students. hall....be prepared to be amazed!! !